Kariveppilai is the Tamil name for Curry leaves. 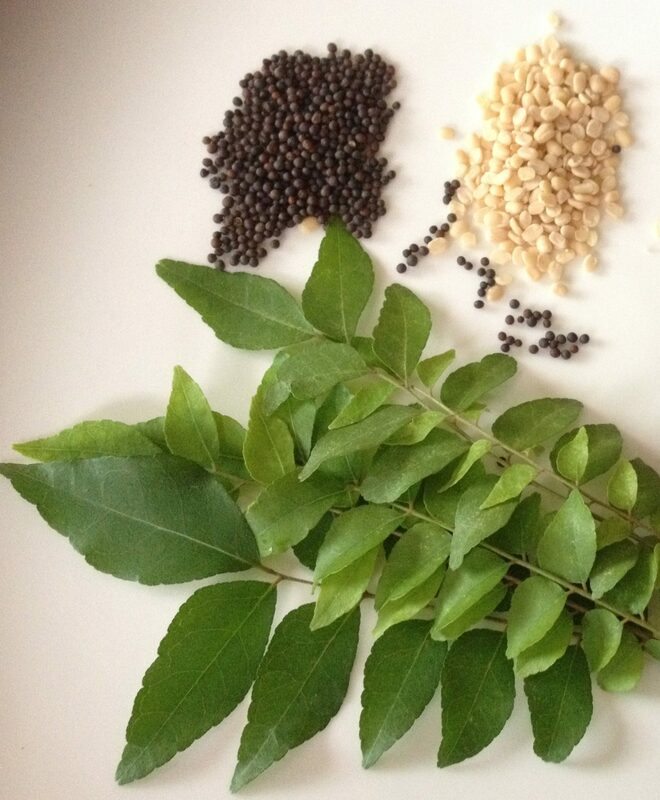 It roughly translates as neem leaf used in curries – Kari+Veppilai – Veppilai is Neem Leaf. It looks almost like neem leaf, but doesn’t carry the bitterness of neem. The wonderful aroma of the curry leaf when fried, makes it a great agent for seasoning in many dishes. 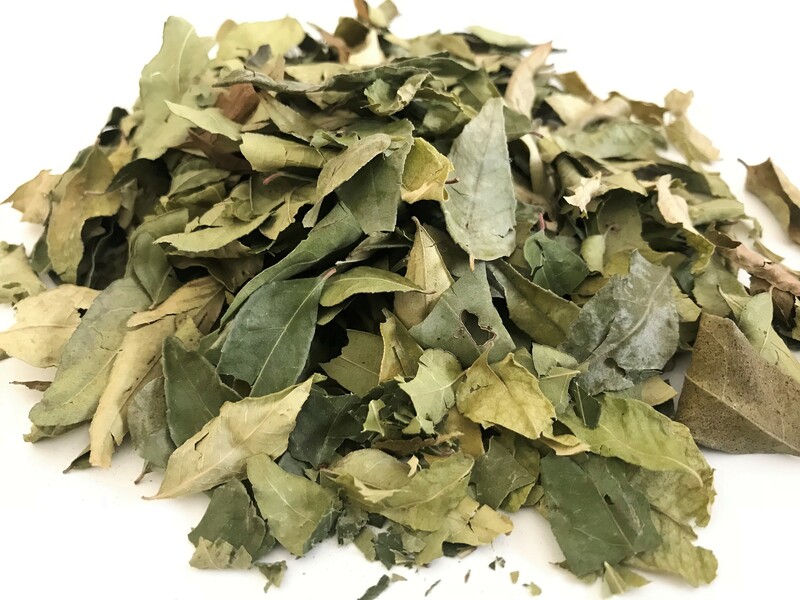 Having known the medicinal effects and health benefits this exceptional tree possesses, the Tamils have been including the curry leaf in varied usages. They are considered to have anti-diabetic, antioxidant, antimicrobial, anti-inflammatory, anti-carcinogenic, and hepatoprotective (capability to protect the liver from damage) properties. The roots are used for treating body aches and the bark is used for snake bite relief. The main nutrients found in curry leaves are carbohydrates, energy, fiber, calcium, phosphorous, iron, magnesium, copper, and minerals. It also contains various vitamins like nicotinic acid and vitamin C, vitamin A, vitamin B, vitamin E, antioxidants, plant sterols, amino acids, glycosides, and flavonoids. Also, nearly zero fat (0.1 g per 100 g) is found in them. When we used to leave aside the fried curry leaf from the chutney, from the sambar, from the kuzhambu/curries on our plates, amma would scold us to chew and finish it off. We would reluctantly do it or sometimes quarrel and throw it away. Then she would secretly add the leaves -powdered- in many dishes… we would unknowingly consume it. 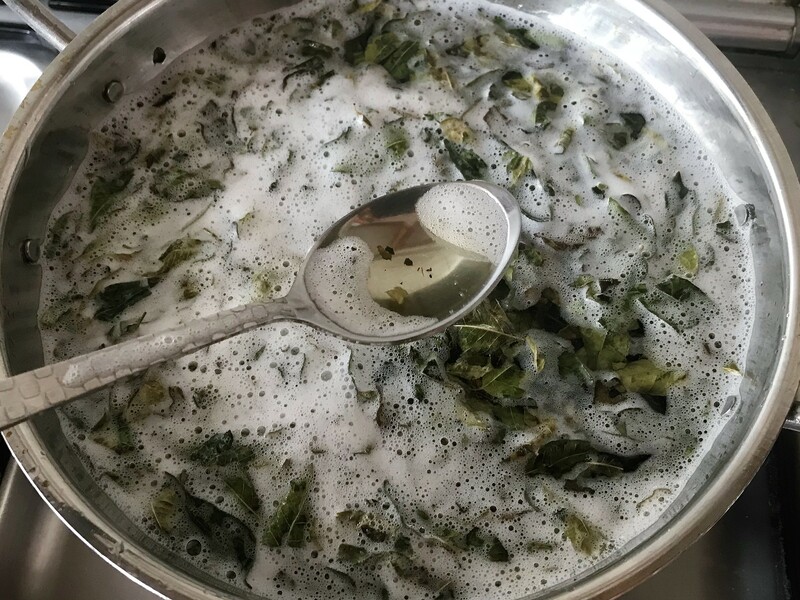 Now, as a mother, I am scolding my daughter to wipe the plate clean chewing all extra curry leaves, and am also trying to inculcate the valued curry leaves in many dishes, without my child’s attention. No fault here with the curry leaf, but some genetic disorder of setting aside chewable things from blended dips. Curry leaves are herbs that are known to have essential nutrients that help in conditions like weight loss, blood pressure, indigestion, anaemia, diabetes, acne, hair loss, et al. 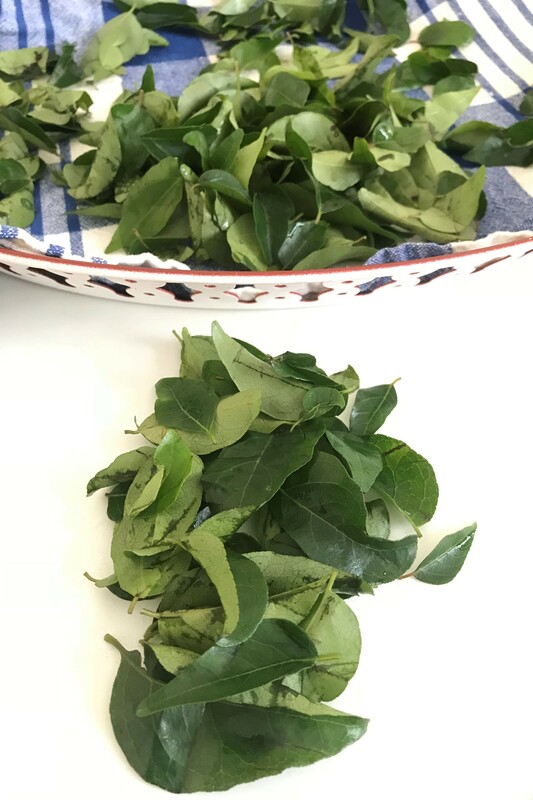 These aromatic leaves, also known as kadi patta, have nutrients like copper, calcium, phosphorus, fibre, carbohydrates, energy, magnesium and iron. They also possess many types of vitamins like vitamins A, B, C and E and amino acids beneficial for health. The specific usage of the curry leaf in preparing Hair Oil is the topic of this post. Curry Leaf Oil is a great coolant for the hot climate of the southern part of India, especially Tamilnadu. It also tackles early greying of hair and aids in hair growth – whether applied as oil or consumed in various dishes. I have used kariveppilai yennai when young and still see appa (father) use it. We also make fun of his moustache having turned grey sooner than his hair, thanks to the kariveppilai yennai/ curry leaf oil. The aroma of curry leaves slowly cooked in coconut oil for the purpose of black, thick hair, takes me to my childhood. The same is done with marudhani/henna while making henna oil. Here, I have not followed the same procedure. 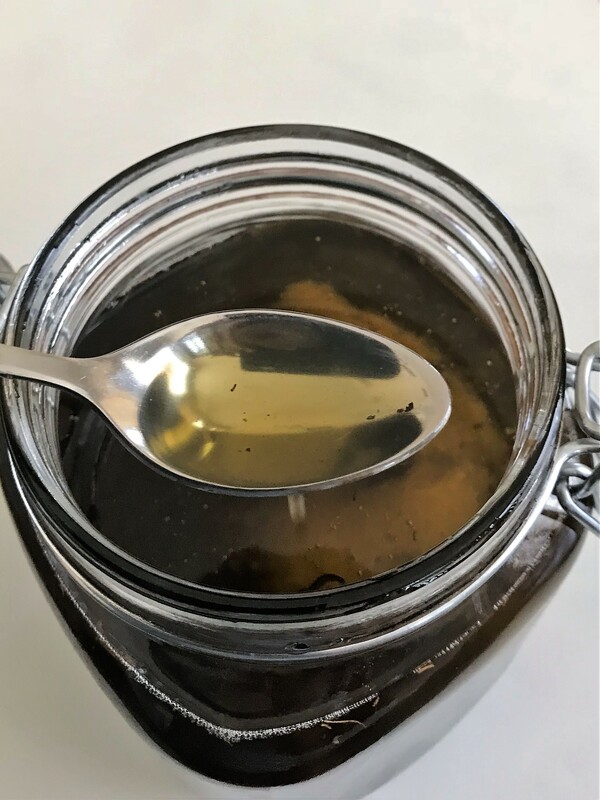 I took the short cut method of sun drying kariveppilai directly and slow cooked in oil. 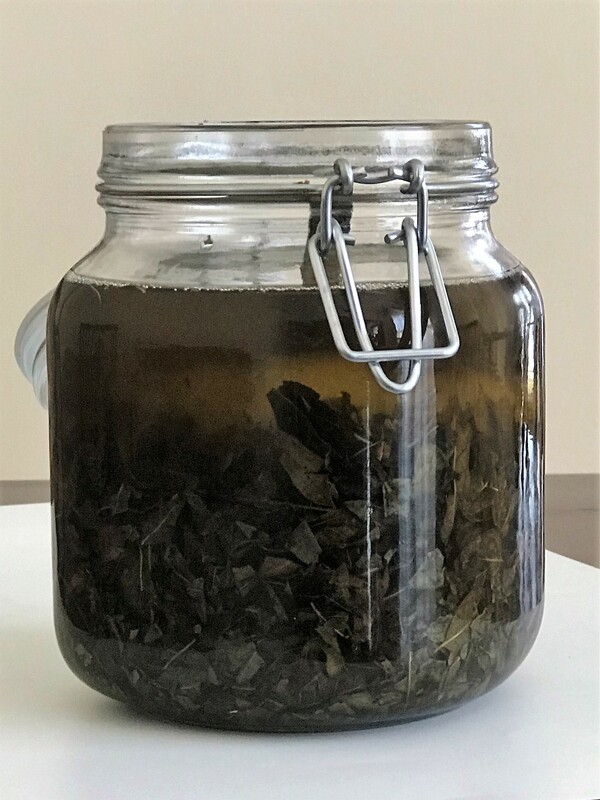 There is no compromise in the quality of oil, in comparison to the previous traditional technique – the aroma and colour seems to be the same. 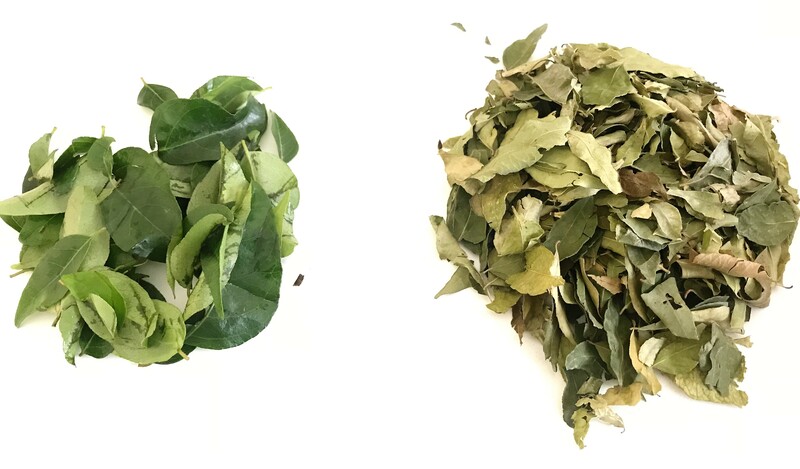 While using the curry leaf thins/sheets, they would settle down in the bottom of the bottle and leave a clear residue on top, but here- the dried curry leaves occupy more space in the bottle and yet, the oil on top is a clear residue. 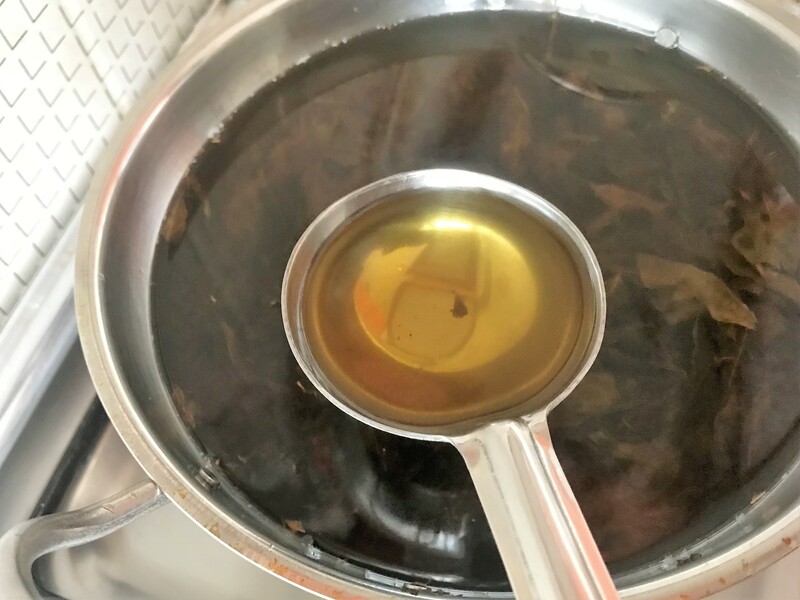 Later, when the oil is mixed too much with the leaves, one can filter and use. 5. Once the leaves are dried, they are ready to be used in the oil. 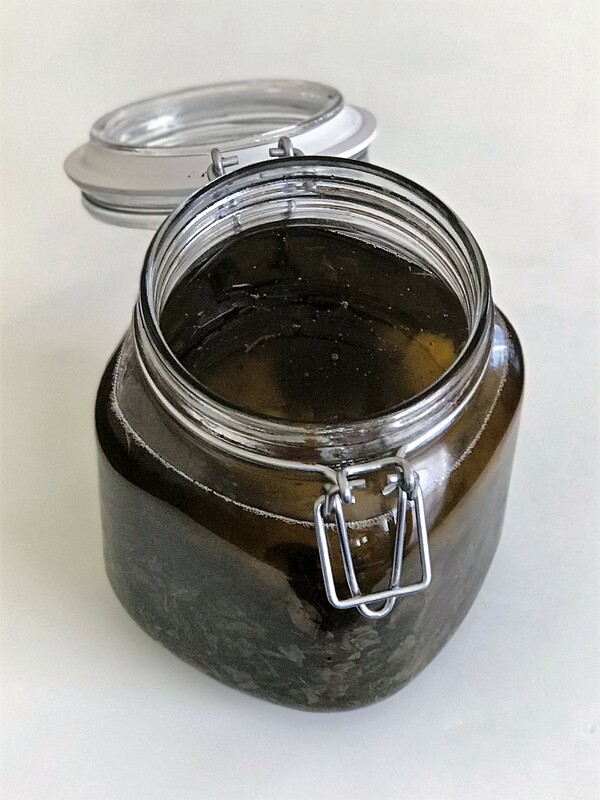 In a wide pan, pour pure coconut oil – see label for aromatic ingredients, other oils which might have been mixed with coconut oil. We need only 100% coconut oil – preferably cold-pressed. Most branded coconut oils are refined, can’t help.. proceed. Measure 6 cups dried curry leaves and mix in the oil, before it turns hot. If dried leaves are added after oil is heated up, the leaves would be fried and would give out a burnt smell. Hence, drop the leaves in, while the temperature of oil is normal. 3. 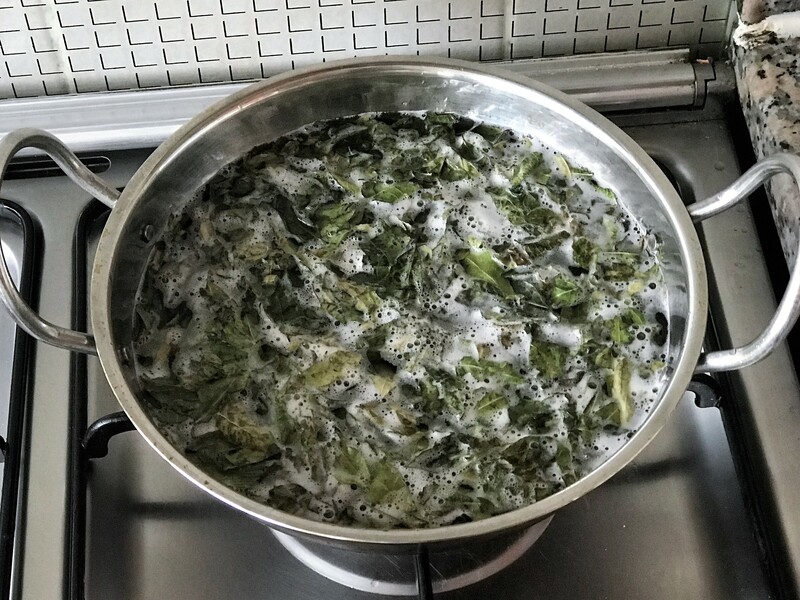 Once the oil starts to heat up, simmer the stove and let the leaves cook in oil for about 30 minutes, till the colour of oil starts to darken. 4. Switch off and let the oil cool. 5. 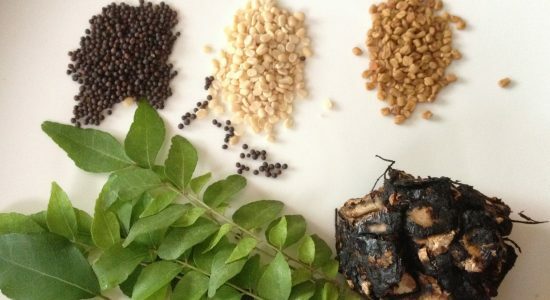 Store oil with curry leaves in a bottle and use everyday.